I spotted this recipe on the blog Sidewalk Shoes the other day that is so familiar to me and yet…I’ve never shared it here. Of course that should be no surprise, I would have to be churning out 10 recipes a day to share all that I have in my repertoire so sometimes it’s nice to get a little nudge from other sources and remember how much I love something, particularly when it’s chocolate and tomorrow is Valentines Day…ahh, love is in the air and what better than chocolate to drink, right? 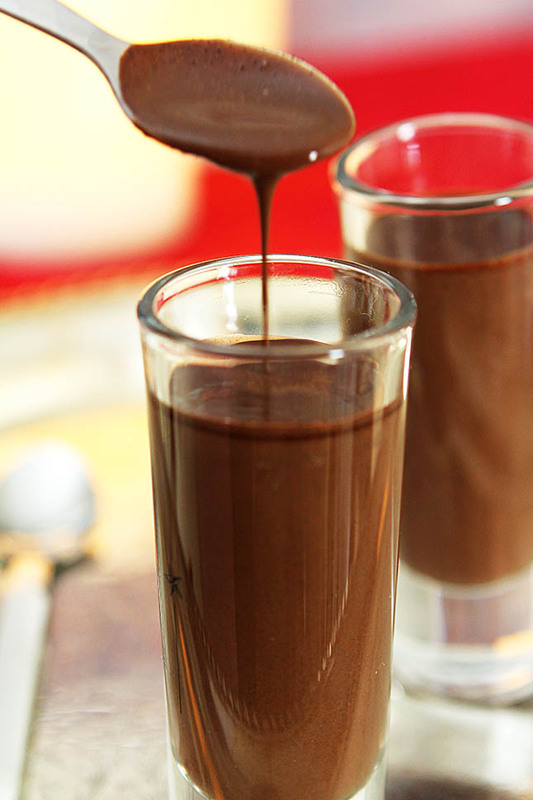 Yesterday I shared a Raspberry Boccone Dolce which is easy and SO good but in the realm of ease nothing beats these spiked chocolate espresso shots if you want a simple dessert. This recipe originally comes via Donna Hay; known far and wide on the other side of the pond and down under; sort of our Martha Stewart except not an ex-con! I’ve received her magazines on and off over the years and this simple shot was memorable. Now…me being me I had to change it up a bit and oh boy is this change good. How? Tequila! If you still think tequila’s only use is for margaritas or shots off of your (or someone else) arm, you need to think again. It adds such a nice element of heat to a coffee and/or chocolate cocktail. Someone once asked me, ‘Doesn’t it make them taste too salty?’ Evidence of poor tequila’s association with a salty margarita. I promise you it’s neither salty or citrusy when removed from the ubiquitous marg. It just adds the most subtle heat (unless you double the suggested shot). Place the coffee beans and cream in a small saucepan; bring to a simmer. Cook for 5 minutes and then turn off the heat and allow the cream and coffee beans to steep for 20 minutes. Strain the cream and return to the pan. Add the chocolate to the cream and heat on low until it dissolves; stir in the coffee liqueur and tequila. Pour the mixture into 6 shot glasses and refrigerate until cold; at least one hour. Serve as an after dinner drink/dessert; spoons optional! I need this in my life! This is the kind of shot I can handle. By the way, I love the bit about Donna Hay being like Martha Stewart except not an ex-con. I needed a good chuckle! Glad to provide the chuckle Miranda; color me weird but after her antics there is no respect. None at all! 🙂 Thanks for stopping by and Cheers! What a delightful little glass of joy and the spoon idea is brilliant. I love your comments and yes, it is a little glass of joy; perfect description! Oh alright, I’ll have one! Wow! All I can say is wow! Unforgettable, indeed, and the perfect delight for Valentine’s Day. They were so good…worthy of a Cheers! Really fun stuff! I’ve heard of this, but never made it. The addition of tequila sounds perfect to me. I’d think just 1 shot — more than that probably would be overpowering. Really good — thanks. One is enough for me too…but one of my ‘testers’ wanted a bit more…so I left the quantity up to the person making them!